At the invitation of Premier Li Keqiang, Prime Minister Edouard Philippe of the French Republic will pay an official visit to China from June 22 to 25. During the visit, President Xi Jinping will meet with Prime Minister Philippe. Premier Li Keqiang will hold talks with Prime Minister Philippe and Chairman of the National People's Congress (NPC) Standing Committee Li Zhanshu will meet with him. Our two sides will exchange views on China-France relations, China-EU relations and international and regional issues of mutual interest. Prime Minister Philippe will also travel to Shenzhen and Shanghai for a visit. France is a permanent member of the UN Security Council and a core major country of the European Union. It is the first major Western country to formally establish diplomatic relations with the People's Republic of China. Currently, the China-France ties are continuously growing in a steady and sound way with ever deeper practical cooperation across the board and cultural and people-to-people exchanges and close communication and coordination in international affairs, which has played a positive role in promoting the prosperity and stability of the world. In January this year, French President Emanuel Macron paid a successful state visit to China. The two heads of state reached important consensus on further elevating the China-France comprehensive strategic partnership. This visit is Prime Minister Philippe's first visit to China since he assumed office. We believe that it will play an important role in enhancing political mutual trust and elevating the level of our cooperation and exchanges in various areas and inject new impetus into the development of the China-France comprehensive strategic partnership. As agreed by the two sides, Prime Minister Peter O'Neill of the Independent State of Papua New Guinea will visit China from June 20 to 26. Prime Minister O'Neill's visit to China is an important high-level exchange between China and Papua New Guinea this year. During the visit, President Xi Jinping will meet with Prime Minister O'Neill. Premier Li Keqiang will also meet with him. The leaders of our two countries will exchange views on China-Papua New Guinea relations as well as other important issues of mutual interest. Besides Beijing, Prime Minister O'Neill will visit Shanghai, Zhejiang and Guangdong. Over the past forty-two years since the establishment of diplomatic ties between China and Papua New Guinea, thanks to the concerted efforts of both sides, our bilateral relations have achieved remarkable progress. Notably, in November 2014, President Xi Jinping and Prime Minister O'Neill agreed to establish the strategic partnership featuring mutual respect and common development. Under the guidance of this important consensus, the China-Papua New Guinea relations have entered a new stage of rapid development. In November this year, President Xi Jinping will travel to Papua New Guinea for the APEC Economic Leaders' Meeting, which will provide an important opportunity for the further development of China-Papua New Guinea ties. China is willing to work with Papua New Guinea to maintain the momentum of high-level exchanges and interactions at other levels, deepen mutually beneficial cooperation in all dimensions, and enhance communication and coordination in international and regional affairs so as to move forward the China-Papua New Guinea strategic partnership. 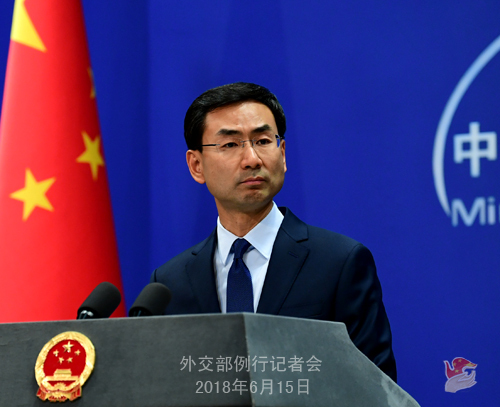 At the invitation of State Councilor and Foreign Minister Wang Yi, Sidiki Kaba, Minister of Foreign Affairs and Senegalese Abroad of the Republic of Senegal, will pay an official visit to China from June 19 to 22. This is Foreign Minister Sidiki Kaba's first visit to China. During the visit, the two sides will exchange in-depth views on bilateral relations, the Beijing Summit of the Forum on China-Africa Cooperation (FOCAC) and international and regional issues of mutual interest. In recent years, the China-Senegal comprehensive strategic cooperative partnership has developed rapidly. The political mutual trust between the two sides has continued to deepen, and the practical cooperation in such areas as infrastructure, electricity and public health has achieved fruitful outcomes and brought tangible benefits to the two peoples. Foreign Minister Sidiki Kaba's visit will further deepen the bilateral relations and move forward China-Senegal friendly cooperation. Q: According to reports, a US official revealed that President Donald Trump has decided to impose tariffs on $50 billion worth of Chinese imports, and this will be officially announced on Friday local time. Did the US inform China of that? China said on many occasions that none of the economic and trade outcomes of the talks will take effect if the US side imposes any trade sanctions including raising tariffs. 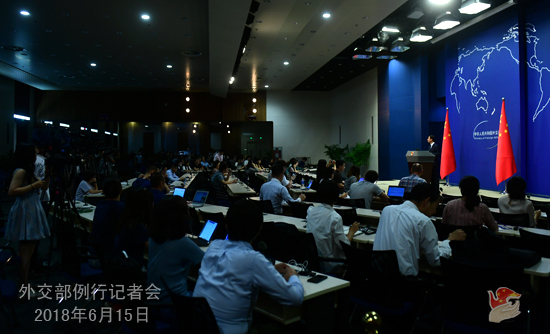 Yesterday, State Councilor and Foreign Minister Wang Yi said that China was prepared to respond if the US chose for confrontation and a lose-lose situation. Do you have any more to say about this? What countermeasure is China going to take? First, the China-US economic and trade ties are mutually beneficial in nature. We always maintain that the two sides should, on the basis of mutual respect, equality and mutual benefit, engage in dialogue and consultation to approach the economic and trade issues, continuously bridge the differences, expand cooperation and deliver benefits to our two peoples. 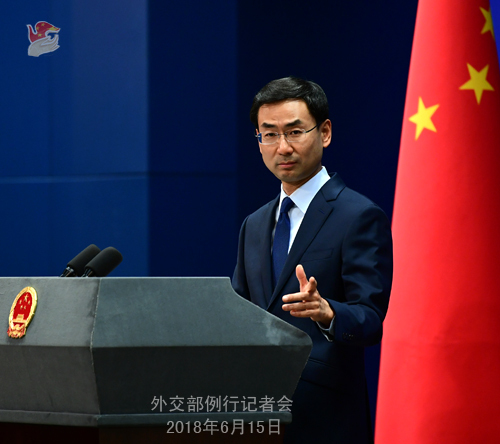 Second, China and the US have maintained communication, conducted consultation, and in fact made some progress on economic and trade issues, including on our trade disputes. If you still remember, the Chinese side issued relevant statement after the trade talks early this month. It is explicitly pointed out in the statement that none of the economic and trade outcomes of the talks will take effect if the US side imposes any trade sanctions including raising tariffs. Third, in early April, the spokespersons of the Ministry of Commerce and the Ministry of Foreign Affairs already responded to some unilateralist words and deeds by the US side. China's position is consistent. If the US takes unilateralist and protectionist moves to harm China's interests, we will lose no time in responding to that and take necessary measures to firmly safeguard our legitimate interests. Q: The Bolivian President will visit China next week. Which Chinese officials will meet with him and what are China's expectations for this visit? A: On Tuesday, we issued the information on Bolivian President Morales's China visit. As to the details that you are interested in, I can give you a brief reply here. This is President Morales's fourth visit as well as his second state visit to China. During this visit, President Xi Jinping will hold the welcoming ceremony and welcoming banquet for President Morales. The two heads of state will hold talks and attend the signing ceremony of cooperation documents. Premier Li Keqiang and NPC Chairman Li Zhanshu will meet with President Morales on separate occasions. We hope that this visit can further deepen our exchanges and cooperation across the board and consolidate the close coordination between our two countries on international affairs so as to elevate China-Bolivia relations to a new level. Q: It is reported that a British businessman has been arrested in Britain for espionage under suspicion of supplying military secrets related to advanced fighter jet engine. What is your response to this? A: I am not aware of the situation you mentioned. In accordance with the holiday arrangements for the Dragon Boat Festival in 2018, the regular press conference of the Foreign Ministry will be adjourned on June 18 (Monday) and resume on June 19 (Tuesday). During the recess, the Spokesperson's Office will receive questions via fax and e-mail as usual.